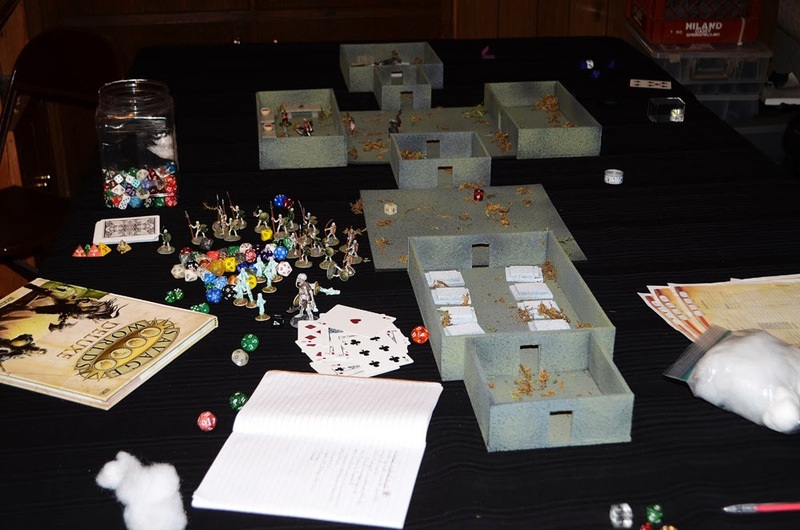 Nate Miller's Tabletop Games: Reflecting on "game night". We had another Forgotten Islands Hyborian game last night. It was the final session to our "Tomb of Voltannox" adventure. Unfortunately I am two games behind on doing reports for this campaign but I am taking a break while another player from this game runs a Star Wars game for the next few sessions. I hope this will give me the time to not only get caught up on the reports but also to get caught up on a few of the projects. Of course there are people out there doing a far better job of it than I am. I've seen some pretty amazing games out there with nicer terrain and miniatures than I have. There are times when I think I should push myself a bit more and try and up the quality of my work but I really think I have found a good balance between what is reasonable and what I can afford and have time to produce. I usually don't sit down and really try and do my "best" on miniatures these days but I also don't play with unpainted figures and terrain. I have found over the years that what I enjoy most about this hobby is playing games with finished miniatures. I don't enjoy playing with unpainted figures and I don't enjoy just painting miniatures to display so I have had to find a balance that works. I think I'm finally getting to the point that I feel like I am playing the kind of games I have always wanted to play. I have had the ability to do these kinds of games for a long time but what I lacked was the focus and commitment to see projects through. I had a lot of nice miniatures but not much in usable collections. I had some nice terrain as well but not enough of any one type to put a good board together for any kind of game. I had to decide what I really wanted to do with my games before I could get organized enough to get these kinds of things done. Doing so has not only made the hobby far more enjoyable for me but more affordable and easier. I completely understand what you are saying. After years and years of painting miniatures without ever seeming to have enough of any type to 'play a game', I have decided to focus on Lord of the Rings and painting to play. Keep up the good work. I'm enjoying the blog.